We have a very comfortable guest lounge, relaxing sofas, tv, desk, magazines and books. 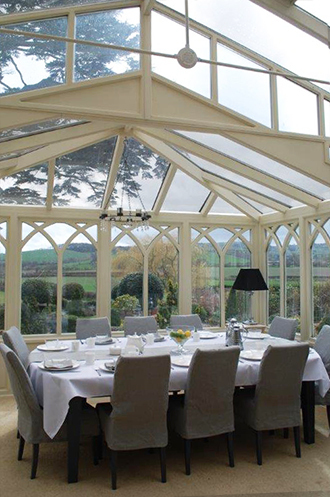 The Orangery is lovely and bright and an ideal place to chill out. It leads out onto the gardens where there are many places to sit and take in the countryside. Food and drink are the joys of life. We love food! Hopefully you will find our breakfasts delicious and filling from traditional English breakfasts to those with an American twist or a European flavour. We make our own muesli, yoghurt and honey mix, We also bake our own bread. If only we could grow our own fruit, nevertheless we still have plenty of that too! Freshly brewed coffee always on the go and an array of teas and juices as you would expect.